I only had to walk half a kilometer from my hostel on the outskirts of Sepilok to reach the roundabout that directs traffic towards Sandakan or Kota Kinabalu. I intended to make it 350km south to the coastal town of Semporna. I had been told not to dare go to Semporna or Lahad Datu by many people due to the insurgent Filipino clans that had recently been terrorizing the area. Police officers and insurgents had been shot dead in the previous days, but the fear of the local people went way beyond reason to me. I wasn’t about to step foot into an actual warzone. While the situation was obviously misfortunate that these Filipino clans were targeting and killing police, I didn’t see an immediate danger to me as a tourist. 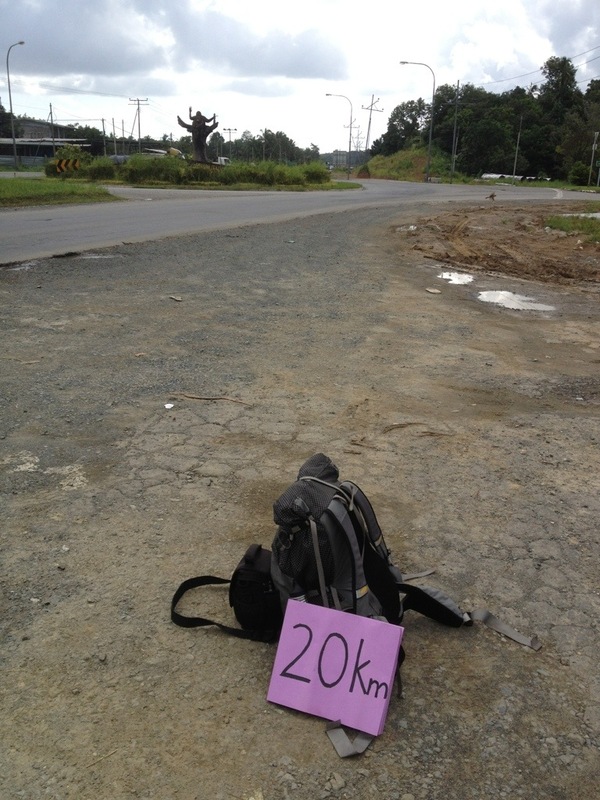 Rather then use a sign with my final destination like I had the day before, I simply wrote ’20 km’ on a large folded piece of purple paper. Within ten minutes, the same silver Isuzu pickup pulls to the side of the road. It must be Ming! Actually it wasn’t. Hill was the name of my new driver. He instantly put me at ease with his easy going demeanor as I got in the car. I also felt lucky that he happened to be going all the way to Lahad Datu which was more then half way there. I was only hoping to make it about 50km to the junction where a road splits off to head south. Hill was playing relaxing Buddhist music and after some basic conversation said I could rest if I needed to, and I did need it since I had been awake since 5 am. I closed my eyes and went in and out of sleep depending on how bad the pot holes in the road were. When I opened my eyes again, Hill and I talked a bit more. He told me about the palm oil plantations and how at only 3 years they can start seeing oil from the tree. Yet after 15 years they have to deforest the land again and plant new trees. I don’t know about the accuracy of it, but I’ll remember to Wikipedia it soon. Before I knew it we were in Lahad Datu, and simply because I had commented on how relaxing the music was, Hill insisted I take the cd. I tried to explain that I wasn’t even traveling with a way to listen to it. It didn’t matter, he wouldn’t take no for an answer. Before I got out of the truck I took a photo of him. I hitched the next right right in front of his house since there was a shoulder for cars to pull onto. A truck stopped within 5 minutes. 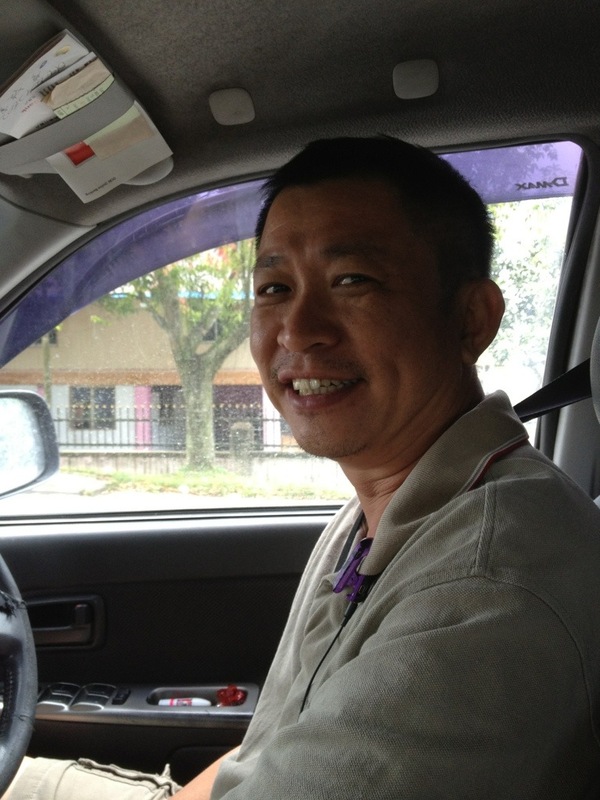 The driver was super friendly but only going about 20km to the Danum Valley turnoff. It was a reserve that I had read about, but the prices to visit were well out of my reach. It sounded like one of the best opportunities to see Orangatuns and other large mammals in the wild in all of Sabah territory. While my next spot was quite serene and empty (see cover photo), I stood in the hot sun without shade for an hour waiting for my next ride. It was the only time in all of Malaysia I had waited more then 20 minutes. To be fair, it wasn’t a great spot in terms of visibility and it was on a downhill, so cars were starting to pickup speed already. On top of that there were long periods with no traffic, then groups of cars where the ones behind couldn’t see me until the last minute. A few mini buses stopped for me (for money), but luckily I had the willpower to wait for my next ride. It seems that most people drive trucks in Borneo, and with the potholed roads the way they are I can see why. So of course my next ride was from a 4X4. Joseph was my drivers name. He was born in Malaysia, but identified with being Chinese because his parents immigrated to Malaysia. He obviously had a successful business because he had travelled to quite a few places. I liked that he had a worldly mind set, and was quite intelligent too. He went to university when he was younger, but if I has to guess it was around 40+ years ago. Conversation flowed quite naturally with him, and we talked about the countries we had been to. Interestingly enough if we both had to choose a least favorite country, we both chose Holland (sorry Netherlands!). I told him how I plan to work in Australia, and he said to make sure to pay a visit to New Zealand for its natural beauty. 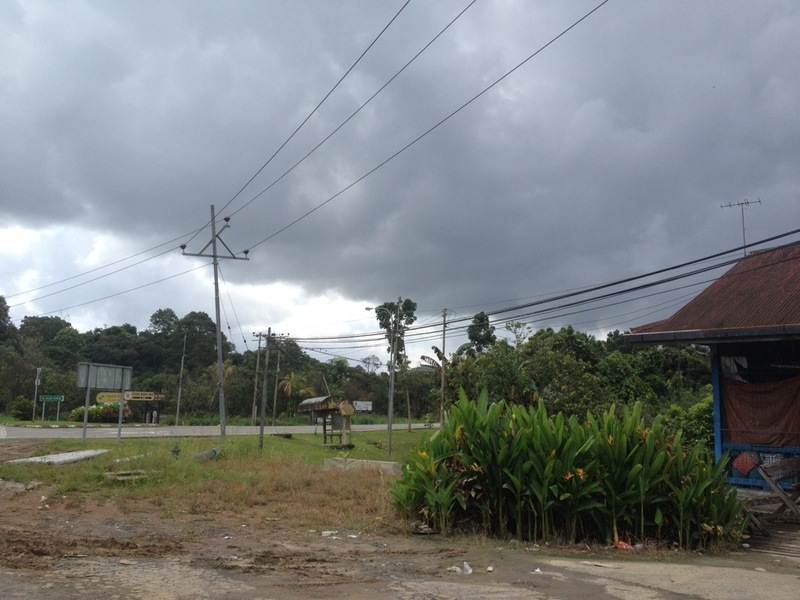 Soon enough we came to the cross roads where I needed to go left to Semporna and he right to Tawau. I thanked him plenty for the ride and the pleasant conversation before he drove off. I was left just after a roundabout at a small convenience store. I bought some dried banana chips since I hadn’t eaten all day, and stood on the road with banana crunching in my mouth until 5 minutes later a little Malaysian made car pulled over. It was two young guys coming from Tawau and they were headed the rest of the way to Semporna! If I had to guess I would have said they were 22 or something, but it turned out they were 30, married and had a couple of kids each. They told me that Semporna had been safe for the last few days but that things were closing down early at night because people were still being cautious. They were nice enough to drop me off right at the seafront. 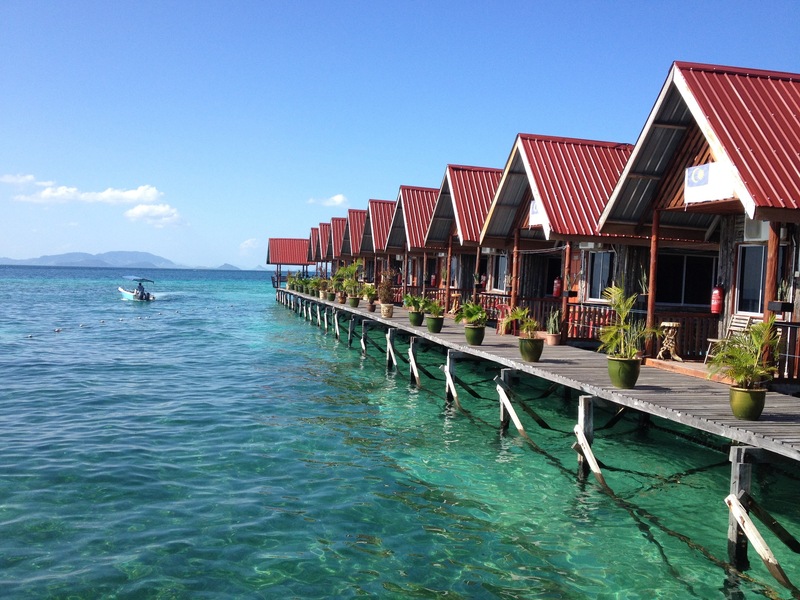 I was exhausted, so I booked a dorm bed and took a boat to the island of Mabul the next day. Totally worth it! That’s the view from my dorm. All the rooms were built on stilts directly over the water. At the moment we’re running a hitch-hiking photo challenge on our website and you are more than welcome to participate with your shots & stories. The best entries will be posted on our website with links to photographers’ pages. You are a BRAVE soul! Thank you so much for sharing your adventures! It makes things SO much easier for fellow travelers. For those of us who aren’t quite adventurous enough, do you have any tips on how to get from Sepilok/Sandakan to Semporna by bus? A friend and I are traveling there in August and trying to get an idea since we only have 2 weeks. Thanks again! I’ll be posting again soon. I’ll be in Australia starting Sept 19th.